Video calling has officially become mainstream. Many of today’s chat apps, including Apple’s eponymous Facetime, include video chatting functionality. These days, chat apps without some kind of video chatting concept feels like it’s falling behind. If you want to hang out face-to-face with your friends, here are the best video calling apps for Android. Check out the best Facetime replacement apps for Android! And make sure that your new video calling app is also one of the best messenger apps! BBM has had a lot of ups and downs since it was released a few years ago, but it seems to have its ducks in a row now. One of its more recent feature additions was the ability for BBM users to video call each other. The feature works as you would expect and it tends to work well for most people. It may not be the best idea for you to switch to BBM, but if you already use it or you already like it, then there’s no real reason to leave it to look at other video calling apps. Get it now on Google Play! 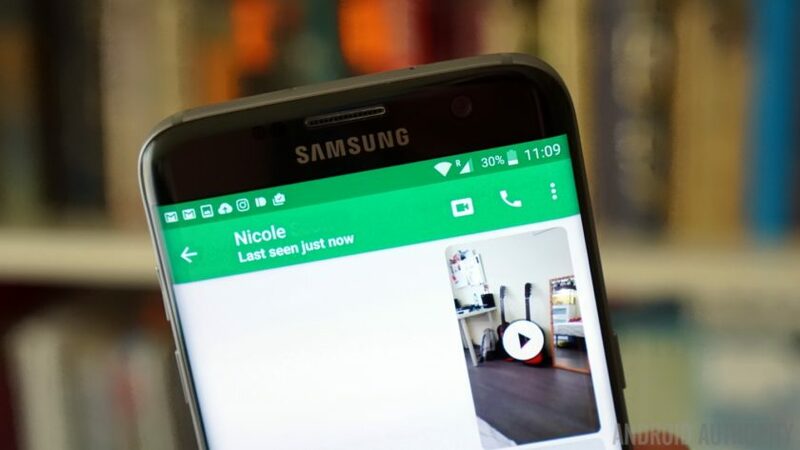 Hangouts is Google’s answer to Apple’s FaceTime and it’s one of the most popular video calling apps on Android. Hangouts is primarily a messaging service but you can also use it to send SMS messages. On top of that, you can also make voice and video calls at your leisure. Video calls can have up to ten participants and it also works cross-platform so you can call someone on your phone and they can answer on their computer. It’s also totally free and pre-installed on many Android devices. ICQ has been around for a very long time. So long, in fact, that it was a competitor to AOL Instant Messenger before being bought by AOL in the late 90s. These days, ICQ is still one of the more solid video calling apps that also has a built-in messenger service. The video calling works rather well and the messaging side of things is also good. It brags about being able to work over 3G web connections and even comes with a password lock for security. JusTalk is one of only a few video calling apps that focuses on video calling first and other features second. It is cross-platform and uses your Facebook account to help you connect quickly to your friends and family. Some of the other features include group chat, free phone calls over data, and it even has things like doodling in video chat and games. Generally, if you’re using something like Hangouts or Skype already, there isn’t much of a motive to leave for something like this. However, if you want something that’s essentially just a video calling app, this isn’t a bad choice. KakaoTalk is a very popular messaging service that boasts more than 150 million users worldwide. It’s also a decent video calling app. The majority of the app is free to use and that includes messaging and video calls with add-ons being the only thing available for purchase. It also comes with voice filters, group chats, and even Android Wear support. You can also add friends using their Blackberry PIN if they have one. LINE is another immensely popular messaging platform that claims to have an astounding 600 million active users around the world. As it turns out, it also does video chatting. Much like Hangouts, there is cross-platform support so you can make calls using your computer or your cell phone. Along with that, you’ll get instant messaging, social networking features, group chats, and a lot more. Of course, everyone knows about Skype. It’s among the most well-known names in video calling out there and as you’d expect, it has an Android app. It boasts a user base of 250 million people which is quite good. The app has undergone plenty of positive changes over the last couple of years as well. It features a decent texting service and voice calls along with the video chatting capabilities. It’s also cross-platform so you can use it pretty much anywhere. Tango was one of the first really good video chatting apps available on Android. Over the years, it’s been added to and improved which has resulted in a full-fledged messaging service complete with video and voice calling. This one also has a discovery feature that lets you find new people to talk to if you’re bored or lonely. There are also a host of group chats you can enter to talk to people about similar interests. It’s unique and fun to use. 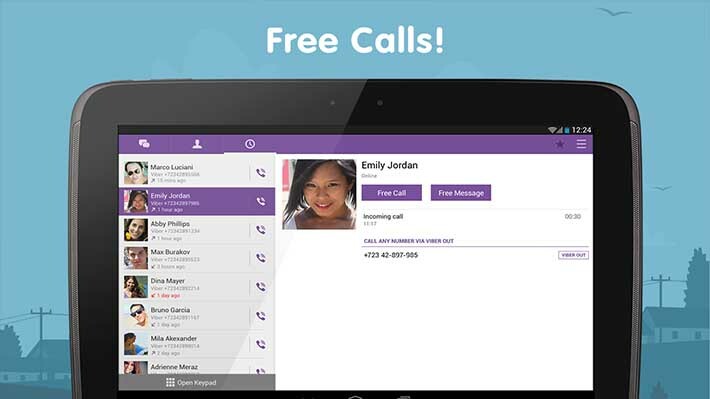 Originally, Viber was a unique application that was billed as a great app for making free phone calls. It has since improved and been added to and, much like Tango, has turned into a full-fledged messaging service complete with voice and video calls. You can also buy Viber Out credits to make calls to non-Viber users on regular phone numbers if you’re looking for a way to do that. It also has Android Wear support, social media support, and cross-platform support. Last and certainly not least on our list is WeChat. This is another very popular messaging service with over 100 million installations to date. It features the standard stuff we’ve come to expect from apps on this list, including solid video and voice calling along with messaging. WeChat also lets you find new friends using a location-based feature called the Friend Radar and it comes with a desktop application. Here are some more awesome apps that help you make FREE phone calls! Or check out the best VOIP and SIP apps for Android! If we missed any of the best video calling apps for Android, tell us about them in the comments!To see our complete list of best app lists, click here.